these little loves: Tips for Bringing a New Mom (or Anyone) Meals + Recipes + Free Printable! 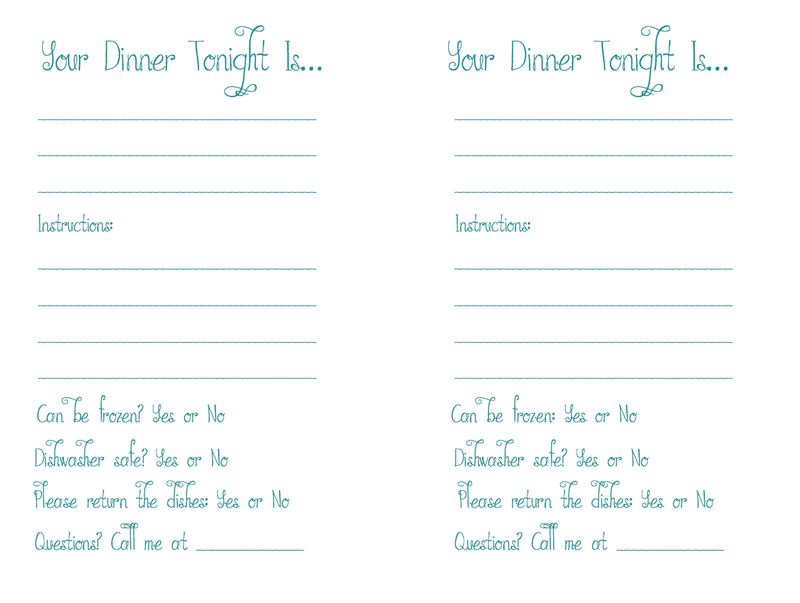 Tips for Bringing a New Mom (or Anyone) Meals + Recipes + Free Printable! When you are sleep deprived, trying to nurse a baby, and can't think straight enough to remember to brush your teeth, the idea of preparing a healthy balanced meal for your family can tip you over the edge. God bless him, my husband would have been up for preparing meals, but I would have gotten a little tired of baked spaghetti, macaroni and cheese, and grilled meat (the three meals he can make). And let's be honest - he was almost as sleep deprived as I was. This was when I had a realization - bringing someone a meal was not just a 'nice thing to do' - it could really be a huge blessing. I think we ate on other people's food for at least two months after we had our son. Two months! So this post is dedicated to those amazing friends, family, and even strangers from church who overwhelmed us with their generosity and thoughtfulness. I have had opportunity to return the favor for several of them recently, which got me to thinking about the little (and big) things that made the whole process easier on everyone. First, a few notes on logistics. Coordinating meals for someone over the course of a few weeks can seem like a difficult task. With a few helpful (free) tools, it has become surprisingly easy. If there will be multiple people bringing food over the course of a few weeks, I would use a tracking system to coordinate. I have used lotsahelpinghands.com frequently. This website allows you to create a private community calendar with a list of emails. Individuals included in the calendar list can see the available dates and sign up accordingly. The automatic reminders in the system are also very helpful. Don't forget to include the new parents in the email list so they can view the calendar and know what to expect. Mealbaby.com is another alternative. Similarly, a google document or calendar would work. In general, I have found a schedule of providing meals every other week day (MWF, for example) works very well. Most people bring enough food for more than one day so leftovers generally cover the non-scheduled days. The start and duration of the calendar differs for every couple. Some people want meals right away while other may not want the meals until after visiting family members leave. Whatever the schedule, I would provide a spot for the volunteers to include what food they are bringing. This helps prevent back to back lasagnas. Who do you add to the list? Start by asking the new parents (prior to baby being born) of a list of emails of anyone who has offered to them to provide meals. Another great place to get volunteers is to have a sign up list at the baby shower. I usually include emails of people in the same 'groups' or 'clubs' as the new parents. For example, ladies from a mom's group or Bible study. Try to keep the scope to something that the family is comfortable with. If they are worried about imposing on anyone, just remind them that most people love a chance to bring new parents a meal and sneak a peak at the tiny baby. In the end, be sensitive to their level of comfort and stay within that. Don't forget to include a summary of the important information for food preparers. Include the address, appropriate drop-off times, the number of people eating, a contact number for the family, and any eating preferences/allergies/restrictions. The primary meal coordinator should collect this information (again prior to baby being born) and include it in the coordination calendar. Providing this up front will prevent the new parents from being bombarded with the same questions. With the right setup, the calendar should pretty much take care of itself from this point. You might want to check in on the schedule every now and then to see if there are any holes. When planning the meal, don't forget to carefully read any details regarding food allergies and restrictions. Other than that, feel free to get creative. To keep this activity fun and not burdensome, think of ways to make it easier on yourself as well. I am in the process of compiling a 'go to' list of dinners for just an occasion (see below). My criteria for this list is as follows: a meal that is easily doubled (one for my family and one to deliver), provides enough food to feed the family for two days, is balanced including vegetables and/or fruit, and leftovers can be frozen. The recipe gets extra bonus points if it is a crockpot recipe. I also pay particular attention to providing variety from the other planned meals that week (if that information is available). I am an avid baker, so my meals aren't complete without a dessert of some sort. And if I am really on a roll, I will include a breakfast treat such as blueberry muffins, granola, or scones. But that is purely bonus and rarely happens. As the goal is to remove meal related work for the family, give a thought to meal clean up and dishes. To minimize any dish washing, bring food in disposable containers that do not need to be returned (like foil baking tins or plastic Ziplock containers). Any non-disposable containers should be dishwasher safe. The morning of my scheduled day, I find it helpful to text the parents a confirmation of the time I will be dropping off the meal. This gives them your phone number to contact if anything comes up and let's them know exactly when to expect you. And finally, when dropping off the meal, don't expect to sit and have a long chat. Remember, you are bringing them a meal for a reason - they have a lot on their plate. I always try to err on the side of too short a visit. If they invite you to stay longer, obviously no need to run off, but still keep it fairly short. Most new parents (especially early on) don't have the energy for entertaining guests for any stretch of time. You may have to get back to my family for dinner, but you always have the option of scheduling a coffee date to catch up should they need some support or a listening ear. And if you live too far away to help out with a meal, why not send them a gift card to a restaurant that does take out? 1. Fruit salad. This is a good one. I'll likely update this list periodically, or you can check out my 'Recipes I Tried and Love' board on Pinterest. I believe you forgot to mention the delicious enchiladas you brought to us years ago :) Great post and fun blog! I hope you guys are doing well!